Santa Monica is a busy beach near Los Angeles, boasting more than 340 days of sunshine per year. 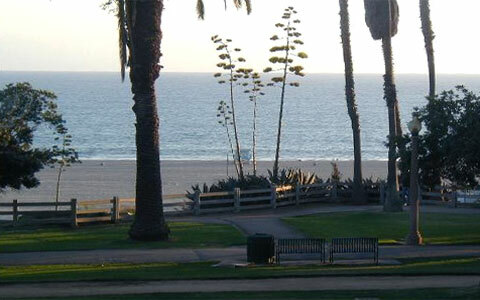 Santa Monica beach is 5 kilometres of wide sand with walk trails restaurants. It includes Muscle Beach. Santa Monica Beach is cleaned and raked daily. Visitors love seeing the dolphins who often come in close to shore for their morning swim. There's entertainment for families near Santa Monica beach, including "Universal Studios" Orlando, the "Chinese Theatre" in Hollywood, and nearby to the south, Disneyland, which is a big day (or two) for children and grown-ups (the big kids). You can drive directly out of Hollywood down the famous Santa Monica Boulevard until you hit Santa Monica pier. Santa Monica beach and nearby Huntingdon Beach are your typical southern Californian beaches that inspired many songs from the likes of the Beach Boys, including "I Wish They All Could Be California Girls." Santa Monica beach is wonderful on a hot summer night, and many people swim to the right of the pier, which features restaurants full of people all having a good time on the Californian coast. Just north of Santa Monica beach is the famous Malibu beach, where the world's most famous movie stars have their homes and holiday homes. You can walk along the water's edge, but there are signs everywhere warning that's it's private property just beyond the high water mark. If you head straight to the beach from Disneyland in Orange County,	you'll hit the famous Huntingdon Pier, which is a great sandy beach full of sunworshippers for much of the year because of southern California's sunshine. Try also heading south to San Diego and La Jolla Beach, where it's a little more laid back than LA but still full of happy beachgoers. And while you're in San Diego, if you're game, cross the border into Mexico and the touristy town of Tijuana. This is great fun for a Mexican cultural experience and cheap shopping, but be sure to fix a price first if you're taking a taxi. 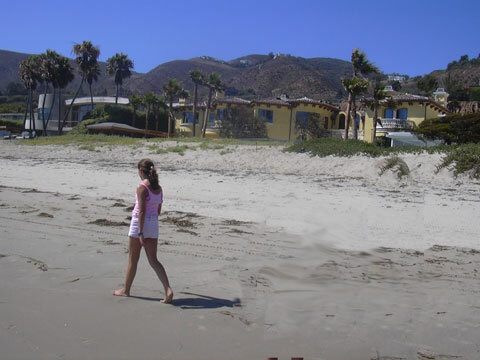 While you're in Mexico, head just a little further south to the Rosarita Beach Hotel which overlooks more nice beaches and is a favourite of Californians. If you want the best seafood around including lobster, there's a little fishing town just a touch further south again called Puerto Nuevo (Newport in English). Southern California has a lot of people, but it's still one of the world's best beach holidays.